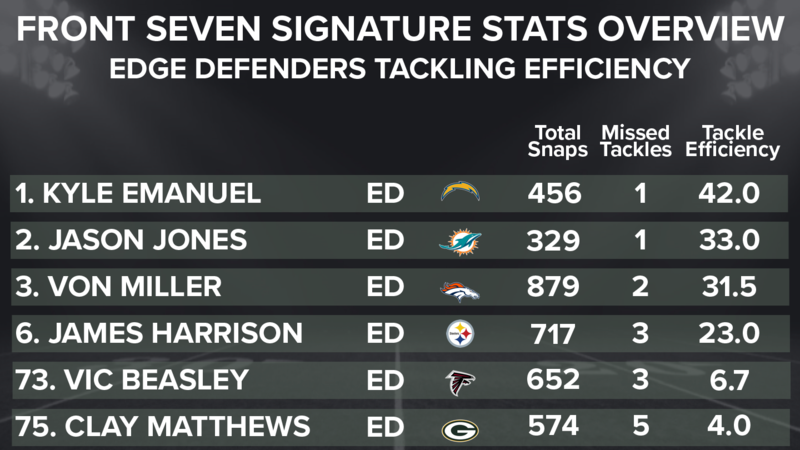 Having previously touched on the leaders in key signature stats on the offensive side including quarterbacks and running backs, we’re jumping to the other side of the line of scrimmage to the defense. Specifically looking at the front seven – though that should be considered the front-six with how often teams line up in nickel and sub-packages. We dug through some familiar stats such as run stop percentage and pass rushing productivity and also highlighted some unique coverage and tackling efficiency stats. We’ve broke this into three bucket positions: defensive interior (DI), which includes nose tackles, defensive tackles, and 3-4 defensive ends; edge defenders (ED), which lumps both 3-4 outside linebackers and 4-3 defensive ends into one label; and linebackers, which groups all off ball linebackers – middle linebackers, inside linebackers, and 4-3 outside linebackers – together. All stats include the playoffs. This should come as no surprise to anyone that follows PFF or paid attention to that vaunted Giants defensive line. “Snacks” was an absolute monster stuffing the run and did so at a rate that dwarfs the next closest player by 3.2 percentage points. Not only did Harrison stop the run with incredible efficiency, he did so on 332 run snaps which is the 10th most of 115 eligible DI’s. His 52 total run stops is 12 clear of Leonard Williams, who plays a more playmaking-friendly position of 3-4 DE. While Harrison doesn’t possess a great pass-rushing skillset, his ability to put offenses in 3rd and long situations more than makes up for that. 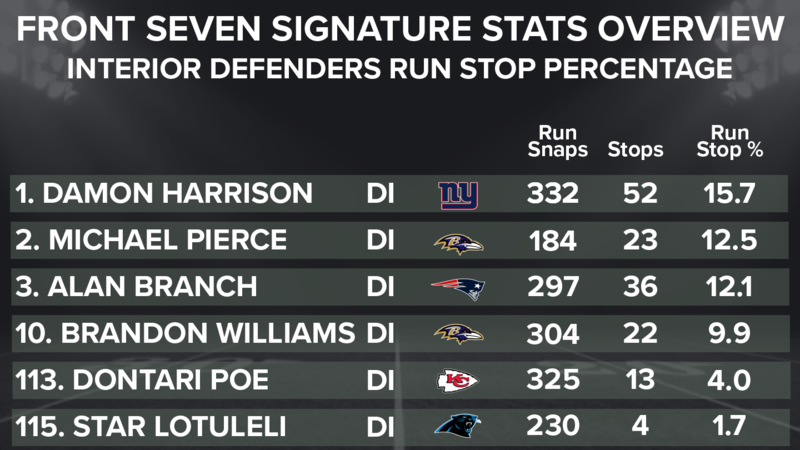 The next two players behind Harrison are both nose tackles in Baltimore’s Michael Pierce with an impressive 12.5 run stop percentage and Jets’ Steve McLendon at an even 12.0. Pierce’s name at No. 2 is interesting considering the Ravens shelled out some big time money to NT Brandon Williams, who lands at No. 9 in run stop percentage at 9.9, but has been better in years past. 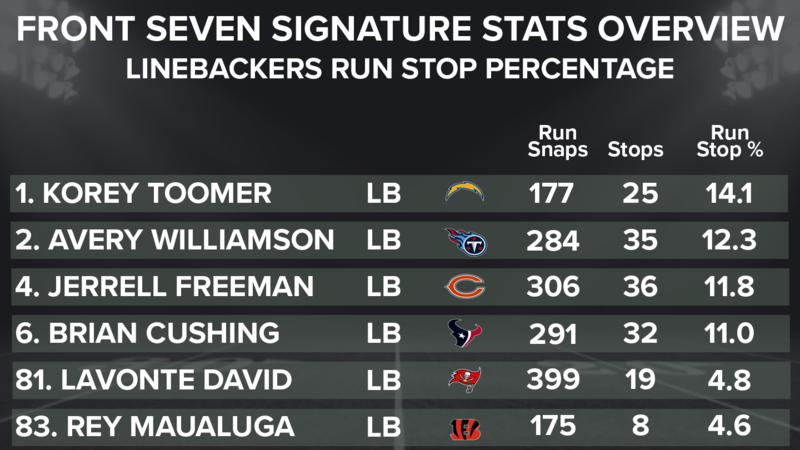 Some notables that failed to make run stops on a consistent basis: Carolina’s Star Lotulelei (1.7 percent, 115th), Tennessee’s (in Denver) Sylvester Williams (3.4 percent, 113th) and Dontari Poe (4 percent, 109th). Another shocker, PFF’s No. 1 player for 2017 tops the list as a pass-rushing force from the interior. Anyone that has watched a Rams game the past three years knows how devastating Donald is and so much has already been written about him. Donald’s combination of speed, quickness, hand usage and instincts is almost impossible for interior offensive lineman to handle. 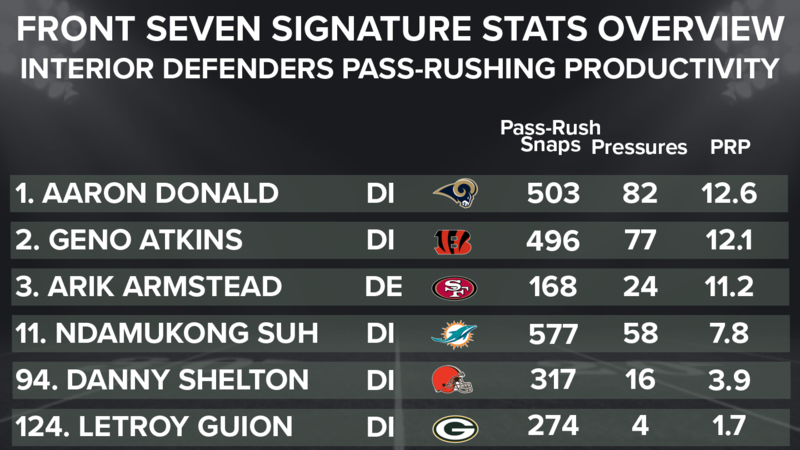 If it weren’t for Bengals’ Geno Atkins impressive season, Donald would be well clear of any player in total pressures and pass rushing productivity. With a PRP of 12.6, Donald amassed eight sacks, 22 hits and 82 total pressures. His 22 hits is seven clear of the next closest player, Jaguars’ (in Arizona) Calais Campbell. Geno Atkins at No. 2 with a PRP of 12.1 and 77 total pressures is well clear of No. 3, 49ers’ Arik Armstead, at 11.2 PRP but just 24 total pressures on 168 pass rush snaps. Dolphins’ Ndamukong Suh had the third most total pressure but with just 58 and a PRP of 7.8. Two of the best in the business top the list in efficiency getting after the quarterback in Mack and Broncos’ Von Miller. 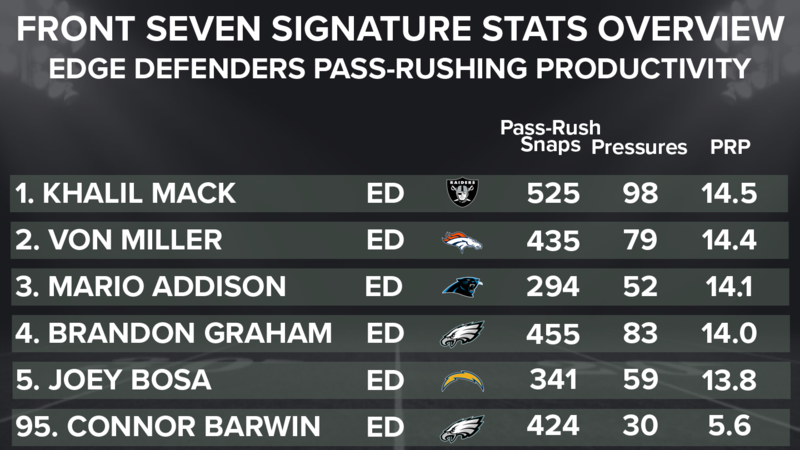 Separated by just 0.1 PRP, Mack takes the crown at 14.5 while also rushing the passer 90 more times in 2016 resulting in 98 total pressures to Miller’s 79. While Miller did have more sacks – 14 to 11 – we know that a mere three percent of a player’s snaps doesn’t tell the whole story. Mack was able to rack up 76 hurries, 21 more than Miller. An underrated Mario Addison comes in third in PRP at 14.1 and 52 total pressures. Addison rushed the passer 294 times with 289 of them from the defensive right side. Also close behind in fourth is Eagles’ Brandon Graham at 14.0 and Chargers’ Joey Bosa at 13.8. A relative unknown, Emanuel is a former teammate of Carson Wentz as the former North Dakota State Bison was drafted in the fifth round of the 2015 draft. Emanuel missed just one tackle while making 35 tackles and six assists and a tackling efficiency of 42.0. His lone missed tackle came in the running game where he totaled 24 tackles and five assists. Miami’s Jason Jones comes in at No. 2 also missing just one tackle all season but did so while making only 27 tackles and five assists and an efficiency rating of 33.0. Von Miller makes another appearance in a signature stats list as the superstar is known for his pass rushing chops but not much is said about his sure tackling ability. Miller missed just two tackles while racking up 56 solo tackles and five assists for an efficiency of 31.5. Other big name players that didn’t miss often are New York Jets’ Sheldon Richardson (29.5, fourth), Steelers’ James Harrison (23.0, sixth) and Redskins’ Ryan Kerrigan (21.0, seventh). Some notables that tended to whiff when attempting to tackle the opponent: Packers’ Clay Matthews (4.0, 75th out of 77), Falcons’ Vic Beasley (4.1, T-73rd), and Seahawks’ Cliff Avril (4.1, T-73rd). Typically a signature stat PFF uses to highlight excellent cornerbacks, it’s also a good indicator for how well linebackers perform in coverage as well. A rather simple stat, yards per cover snap is exactly what it sounds like, how many yards on average does the player allow when he is in primary coverage on the play compared to the coverage snaps he plays overall. Of course a stat is just a stat and doesn’t show the full ability of the player as coverage scheme, surrounding talent, and responsibility will mask deficiencies as will simply being targeted effect how many yards the player gives up. That said, the most efficient linebacker in limiting yards via the passing game in 2016 was Texans’ Brian Cushing as he allowed a paltry 0.32 yards per cover snap. Cushing isn’t known for his ability as a coverage linebacker (outside his rookie 2009 season where he hauled in 4 interceptions) and has had an up-and-down career in all facets of his game. He was able to put together an impressive 2016 grading as the 16th best coverage linebacker at 82.3. No. 2 on the list also graded as the second best coverage linebacker in 2016 and that’s Eagles’ Jordan Hicks. 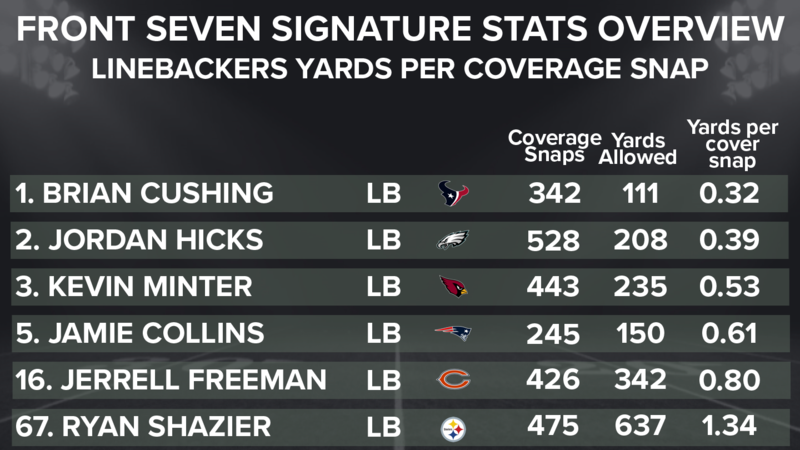 At 0.39 yards per cover snap, Hicks backed up his position leading five interceptions with impressive consistency when he wasn’t making plays on the ball. Cincinnati’s (in Arizona) Kevin Minter comes in at No. 3 allowing 0.53 yards per cover snap as the Bengals hope to strengthen the middle of the field in pass defense. A few notables on the list include Browns’ Jamie Collins. He lands at No. 5 but only from his snaps in New England before the trade and subsequent position change. He allowed 0.61 yards per cover snap and hauled in two interceptions. 2016’s No. 1 graded linebacker Jerrell Freeman comes in tied for 16th allowing 0.8 yards per cover snap. Steelers’ Ryan Shazier allowed 1.34 yards per cover snap ranking 67th out of 76 eligible. Shazier is known for his playmaking ability and flashy plays as he matched Hicks’ 5 interceptions but did so while allowing 637 yards when his coverage area was targeted. Los Angeles Chargers’ Korey Toomer tops the list as the most efficient run stopping linebacker in 2016 but did so on just 177 run snaps. It marks the second year in a row a Chargers linebacker had the best run stop percentage as Denzel Perryman did so in 2015 with an impressive 18.3 percentage but on 169 snaps. Perryman wasn’t able to maintain that efficiency in his sophomore campaign dropping to 9.4 percent on 213 snaps. Toomer has bounced around the league until finding a home with the Chargers and if he’s able to maintain that level of play, four teams will have missed out on a late bloomer. Tennessee’s Avery Williamson comes in at No. 2 with a run stop percentage of 12.3 amassing 35 stops on 284 snaps with Chicago’s Danny Trevathan nipping at his heels at 12.1 percent. Jerrell Freeman shows off his well-rounded skillset as his 11.8 percent ranks fourth. Brian Cushing at No. 6 with 11.0 run stop percentage shows how stats can be misleading as Cushing’s 58.1 run defense grade highlights that despite making a lot of plays, Cushing often finds himself out of position and blocked out of the play.